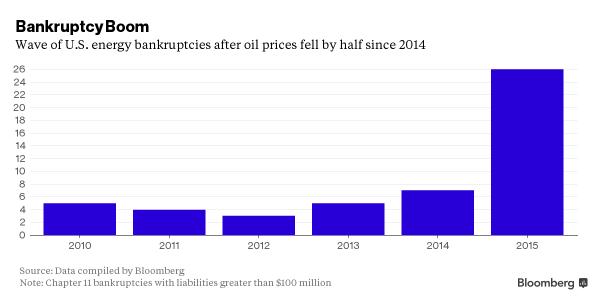 Dozens of oil and gas companies went into bankruptcy last year. While energy E&P companies were dropping like flies in 2015, credit rating agencies and banks have remained awfully quiet and apparently buried their heads in the sand. You see, the Fall Borrowing Base Redetermination by banks on the E&P sector was supposed to take place around October 2015. According to a Haynes and Boone, LLP survey conducted prior to the fall borrowing base redetermination season, industry observers and insiders are predicting a decrease in the ability to borrow against reserves by an average of 39%. The result of base redetermination does not require public disclosure. Nevertheless, it seemed banks were extremely lenient as the average reduction for 17 companies disclosing the borrowing base reduction results was just 4%. Rating agencies, meanwhile, did not take major E&P downgrade actions till this month in 2016. On Jan. 22, 2016 Moody's Investors Service said it put 120 oil and gas companies on review for downgrades. Rival Standard & Poor’s Ratings Services was way ahead of Moody's. S&P said it already downgraded the debt of 165 U.S. companies back in 4Q 2015, representing $1.5 trillion, led by the oil, gas, and commodity sectors. S&P also said for the full year, downgrades rose by 67%, to 461, the highest level since 2009. From late December to January 2016, Fitch also took individual downgrade action on companies such as NGL Energy (NGL: NYSE), Chesapeake Energy (CHK: NYSE) and Williams (WMB: NYSE). We can see how banks do not want to write off and take a loss from their E&P debt on their books and have motivation to keep feeding the high leverage and not call in the energy loans during the base determination last October. FT reports that as of September 2015, about a dozen E&Ps already had debts as high as more than 20 times their EBITDA. One of the reasons pushing down oil price to the current historical lows, and yet no sign of decline in U.S. production is that quite a few small frackers need to pump oil regardless (even below the economic threshold) just for the cashflow to pay bills and payrolls. So the collective action by banks to sustain the life of many weak oil frackers (so banks won't need to book losses) ironically exacerbated the oil over-supply and price crash speeding up the way for these hanging-in-there frackers to meet their maker. On the other hand, we fail to see the motivation and logic behind the delay by rating agencies who are supposed to have independent (from banks) evaluation model to provide forward-looking financial risk indications. While nobody can say for sure if this conflict-of-interest model has improved since 2008, it is not hard to draw a parallel Déjà vu from the 2008 subprime/housing sector with possible banks influencing rating agencies to the current E&P sector. An even better question right now would be: Is this to allow some insiders time to position themselves "on the right side of the trade"? FT reports the 60 leading US independent oil and gas companies have total net debt of $206bn, more than doubled from about $100bn at the end of 2006, and almost a third of the 155 US oil and gas companies covered by Standard & Poor’s are rated B-minus or below (highly speculative, below investment grade). We don't always agree with Einhorn on his view including Apple long and some of his specific E&P shorts. 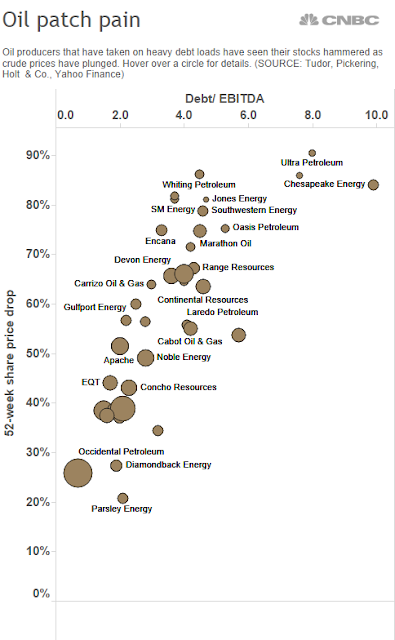 However, we do see a bubble in the E&P sector similar to the 2000 tech bubble. We noted last May that "the sector is long overdue for a shakeup" with 110+ publicly traded E&P companies in North America (mid to small caps), and many of them came to market just in the past five years for the sole purpose of hitting their IPO pay dirt. Many highly leveraged and poorly managed drillers have been able to hide under the cloak of high oil prices (and Wall Street) in the past few years. Now Barclays estimates that without a rebound in commodity prices, the potential oil bonds downgrade volume for 2016 and 2017 could exceed $170 Bn while another $155 billion worth of high-yield debt supply will enter the market. The long overdue credit agency downgrade is only the beginning of a tsunami hitting the entire oil E&Ps (bonds and stocks). More E&Ps will go out of business while some solid companies may get smacked down (but hopefully eventually survive) simply by the sector association. Wall Street had a hand in this Frack Bubble of 2015-2016, not much different from the 2008 housing bubble. We know Shell just fired another 10,000 workers while global oil job losses top 250,000, but it is too early to tell how the market and economy will turn out in this bubble aftermath. Not to be despair though, the better news for now is that with weak shale E&P companies going out of business, oil production should progress to reflect the logical supply volume in the current oil price environment. That should eventually lead to the rebalance of the oil market, price and the proper valuation of the remaining energy stocks.